Navigate, take control, and enjoy an unprecedented level of built-in functionality with NSS evo3. SolarMAX™ HD display technology offers exceptional clarity and ultra-wide viewing angles, combined with an all-weather touchscreen and expanded keypad for total control in all conditions. Cruise confidently with ForwardScan sonar, or fish easier with StructureScan® HD imaging and dual-channel CHIRP-enabled Broadband Sounder™ technology. Built-in Wi-Fi enables access to GoFree® online services, and delivers smartphone monitoring and tablet control to extend your display’s reach well beyond the helm. The NSS7 evo3 features a 7-inch display perfect for centre consoles and other installations where space is at a premium. Includes Insight charts and Broadband 4G™ radar. NSS evo3 displays are compatible with Simrad expansion modules including game-changing StructureScan® 3D imaging and many other plug-and-play network modules. 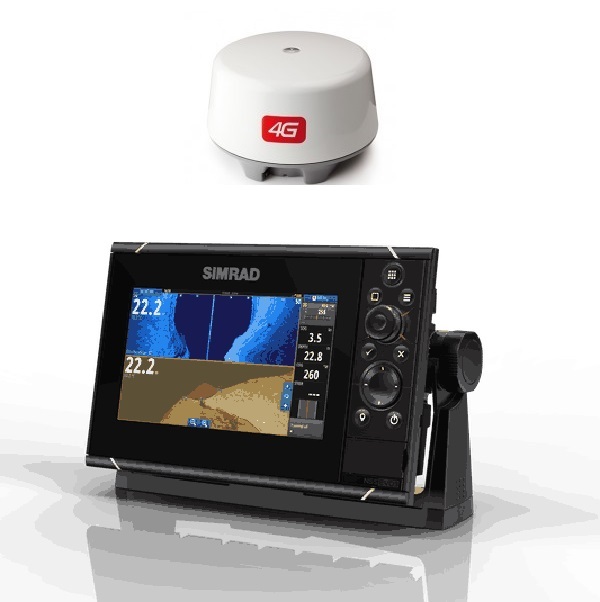 Module capabilities can be shared between multiple NSS evo3 displays, and the ability to add modules at any time means your Simrad display system can easily grow and change along with your boating interests and technology needs. Expand your view with Halo™ Pulse Compression radar, Broadband Radar™, or HD Digital Radar solutions. NSS evo3 displays integrate with these network-connected Simrad radar solutions to provide a full-featured radar interface complete with easy pre-set modes, custom manual tuning, MARPA target tracking, guard zones, overlay views, and many other features depending on your choice of radar system. This model includes a complete Broadband 4G™ radar system, designed for simple installation and ease of use. Broadband 4G™ radar delivers superb close-range target detection and a maximum range of up to 36 nautical miles, combined with advanced radar features such as dual-range operation and beam sharpening. Automatic routing brings the convenience of in-car navigation to boating, helping you to plot a route and get underway with less delay. Simply select a destination, and the NSS evo3 display will suggest the shortest, safest route taking into consideration the draught and dimensions of your vessel. This feature is available with Navionics+ or Navionics Platinum charts (Navionics Autorouting), and with C-MAP MAX-N+ charts (Easy Routing). Built-in GoFree™ Wi-Fi enables online chart downloads, Insight Genesis map creation, and easy system-wide software updates. Browse and purchase a wide range of cartography online from the GoFree™ Shop, and download charts directly to your display’s memory card without leaving the helm. Upload sonar logs recorded on your display directly to the Insight Genesis cloud service to create detailed custom charts, a perfect way to explore your favourite inland and coastal fishing spots. GoFree™ online services can be used anywhere a Wi-Fi internet connection is available. Choose from a wide range of cartography options to best suit your location and usage with support for C-MAP MAX-N+, Navionics, Insight, Insight Genesis, and NV Digital Charts. This model includes Insight charts.